This manual is the result of a detailed consideration of a societal collapse and the civil shift and aftermath that would impact individuals and families who are intent on survival. The purpose of this manual is to provide information to enhance the security, tactics, and survival skills of law-abiding citizens who are faced with civil disorder, lawlessness, violence, and physical threat in a post-collapse environment. The information in this manual is derived from training and experience gained from service with special operations forces (SOF) and subsequent employment as a security contractor in Iraq and Afghanistan. It is a distillation of tactics, techniques and procedures (TTPs) adapted to the threat and environment anticipated in this type of scenario, in order to provide the knowledge needed to survive in a world turned upside down. It is no longer just survival of the fittest but survival of those prepared. The manual will take you from self-defense as an individual, team and family, and on to tactics, techniques, procedures and training that can be used by tactical teams that you may need to form in order to survive or to resist tyranny. In a serious post-event scenario, one of total collapse with several months or years before recovery, families, groups and communities may be forced to create such tactical defense forces to protect personnel, loved ones and resources against hostile forces. There is something in this manual for both the tactical newbie and the military veteran. 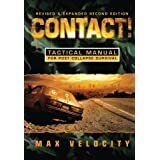 This entry was posted in Book Reviews and tagged Collapse Manual, Max Velocity, Post Collapse Survival, Tactical Manual on October 10, 2014 by GunGuy.